Preheating can be defined as the application of heat to the base metal or substrate before welding. Gas torches, electric heaters, or infra-red radiant pane heaters can all be used to apply preheat, which decreases the weld cooling speed and thereby prevents cold cracking in welds. 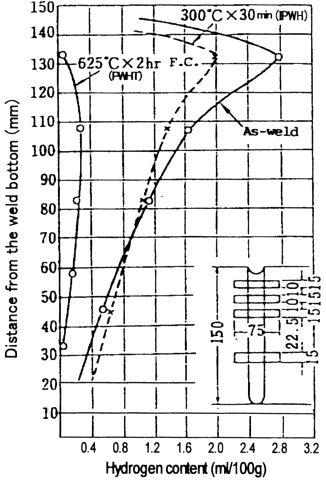 Figure 1 shows how an increase of preheating temperature affects the cooling rate of welds. 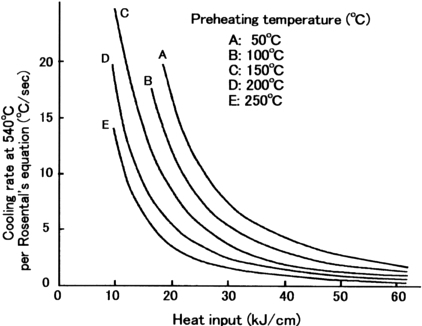 For example, where heat input is constant (e.g., 20 kJ/cm), a 50-degree-C preheat results in an approximate cooling rate of 17°C/sec, while a preheat of 250°C decreases the cooling rate to approximately 3°C/sec. Decreasing the cooling rates prevents the formation of brittle weld structures, and removes diffusible hydrogen, which in turn prevents the occurrence of cold cracking in welds. Figure 2 shows the preheat temperature dependenceon cold cracking in 780 MPa high tensile strength steel welds. As the preheat temperature increases the crack ratio decreases. Among these heating or heat treatments, PWHT and IPWH are the most common procedures used in welding. The others are used for limited applications in some welding fabrication fields. The purposes and procedures of PWHT are detailed in Kobelco Welding Today, Vol. 4, No. 2, April 2001. IPWH is usually carried out with gas torches, on welds right after welding is finished, while the weld still maintains the preheat temperature, by using comparatively lower temperatures and shorter heating times (250-350°C x 0.5-1h), prior to PWHT. IPWH decreases diffusible hydrogen to an adequate level (though higher than with PWHT as shown in Fig. 3) to prevent cold cracking.